To access video, Become an EPIC Member. In this interactive tutorial, participants explored ways in which ethnographers can have an expanded role in addressing social issues and other wicked problems. In particular, it explored how ethnographic thinking can frame problems and catalyze change. Participants were first provided with a grounding in ways to approach systemic challenges and social entrepreneurship, including discussion of some successful roles ethnographers have played as part of inter-disciplinary teams. Then, instructors introduced three case studies (and frameworks of systems within them) that participants later used as material for exploring how broader applications of ethnographic thinking might work in real world settings. Those included: labor practices in the seafood industry, encouraging energy conservation, and managing the refugee crises. In the second part of the tutorial, participants divided into groups where they were introduced to a ‘flashpoint’ (an imagined future state) in which various shifts took place that were likely to impact the topic framework with which they began. Their task was to the redefine their framework in light of the flashpoint, and consider how it might change partnership models, positions, motivations, actions, interventions, and disruptions. This exercise was a vehicle for making concrete the ways ethnographers can better serve as facilitators for exploring contextual ripple effects, creating common ground, working collaboratively, and building coalitions. Finally, participants were asked to identify other opportunities for ethnographic thinking within their revised framework. The overall goal of this workshop was to stimulate thinking about a more robust, engaged and integrated role for ethnographers to contribute to the shared work of taking on important social and environmental issues, by better understanding the systems in which they operate and to consider new forms of contributions ethnographers might provide. Beyond that, we wanted to provide participants with a beginner’s toolkit to bring back to their own work environments where they might be empowered to lobby for a more prominent role for ethnography in these systemic social and environmental challenges. Explore strategies to elevate the role of ethnographers beyond data collection and insight provision. Find opportunities for anthropologists / ethnographers to better serve as facilitators to create common ground, work collaboratively, and build inclusive coalitions. 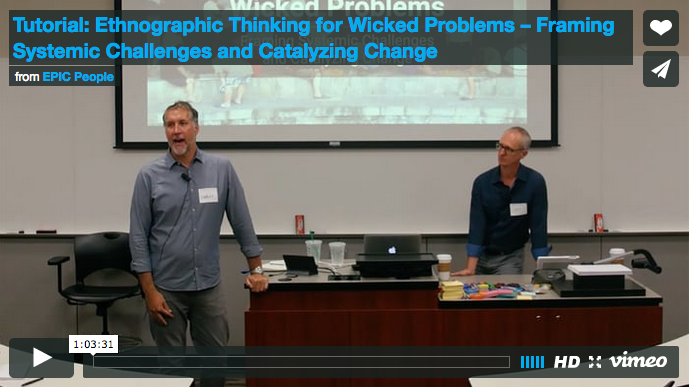 Imagine the role of ethnographers to solve ‘wicked problems’ and take on systemic challenges. Rediscovering Social Innovation. James A. Phills Jr., Kriss Deiglmeier, & Dale T. Miller. Stanford Social Innovation Review 2008. Social Entrepreneurship: The Case for Definition. Roger L. Martin & Sally Osberg. Stanford Social Innovation Review 2007. Jay Hasbrouck, PhD, is a research strategist and anthropologist whose insights have shaped product and service innovation for clients in healthcare, technology, tourism, consumer products, health and beauty, home care, nutrition, and government. He is passionate about designing learning processes that optimize for the most useful and relevant insights. He has held positions at IDEO, Intel, and USC’s Center for Sustainable Cities, and managed national and global scale innovation projects, including in Mexico, Egypt, Germany, South Korea, Brazil, Japan, Malaysia, China, Russia, France, and the United States. He has been active in the American Anthropological Association, EPIC, and ACM SIG-CHI. Jay's new book is Ethnographic Thinking: From Method to Mindset. Charley Scull, PhD, has worked in the consumer insights and innovation spaces since 2005. His work has spanned from the granularity of package re-design and local issues like how to increase audience engagement for a botanical garden, to systemic questions like sustainability in the global fishing supply chain and the experience of living with chronic disease. Charley was trained as a visual anthropologist and has worked in the US, Asia and the EU. He is a partner of Practica Group, a consumer research and consulting firm that provides strategic consulting based on ethnographic cultural analysis of consumer practices.